The IRB was promised a stadium of 4 million and the country has answered the call. The way so many people and communities have got behind the Rugby World Cup, turning it into a nationwide celebration has been great. 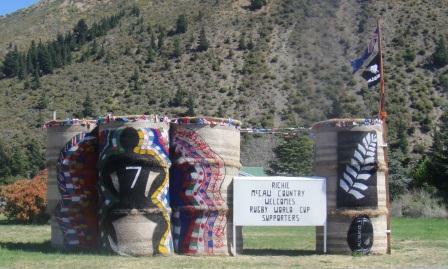 Flags on vehicles, I even saw a Scottish one flying from the window of the driver’s wagon of a train, fences and buildings; sheep painted in team colours; the giant concrete rugby ball , 40 hours in the making, outside the vets in Oamaru which caught John Key’s eye on Friday . . . It would be hard to beat this W(h)anganui house for individual effort, and it would be difficult to top Kurow for community contribution to the collective celebration. This was Richie McCaw’s home town. He was born in Oamaru, grew up on the family farm in the Hakataramea Valley but it was Kurow where he went to primary school and played his first games of rugby. For rugby trivia enthusiasts, Richie is Kurow’s second All Black. The first was the late Phil Gard. The Waitaki Valley has produced another All Black, Ian Hurst, who played for New Zealand in the 1970s. North Otago’s fourth All Black, Jefff Matheson also played in the early 1970s.